When we think of Christchurch, one sad thing immediately springs to mind: the earthquake in February 2011. 185 people died in the second largest city on the South Island. It has been years since this terrible natural disaster, but Christchurch has still not been able to fully recover from it. We visited Christchurch back in 2013 on our first visit, which made us all the more curious about the possible changes made since then on our second visit end of 2017. 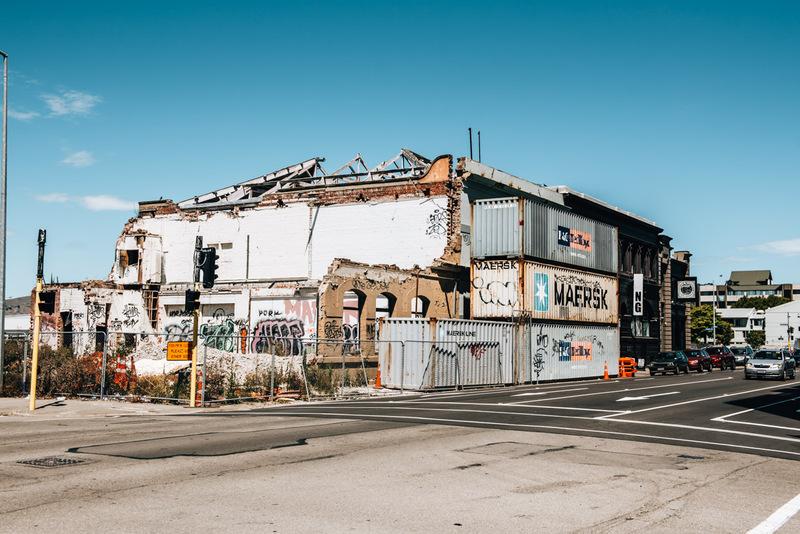 Buildings and renovations have been done in many areas, but still a walk through the city centre pretty quickly reveals how hard Christchurch was hit. 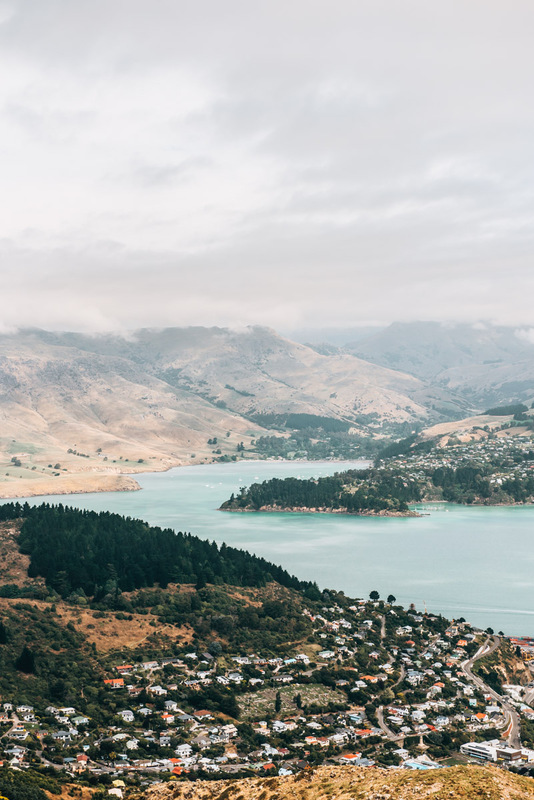 The damage caused by the 2011 earthquake is still present, but from a visitor’s point of view we can confirm that Christchurch is still worth a stopover. 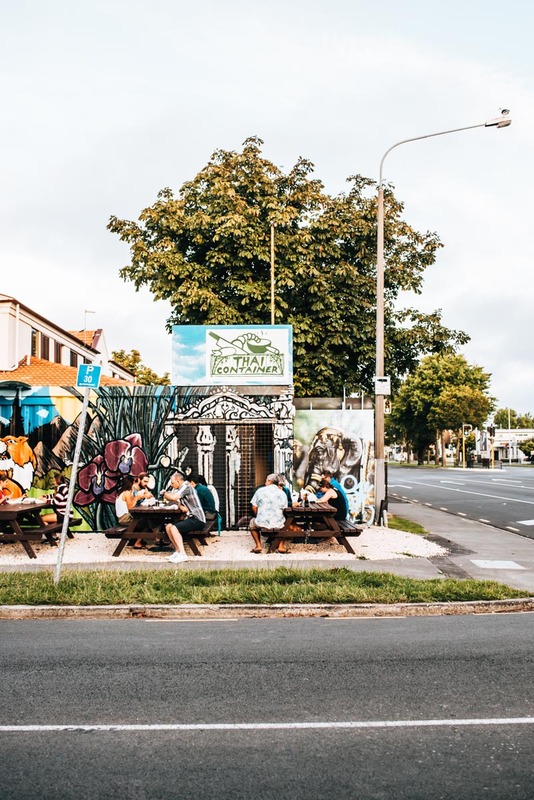 In this blog article, we’ll tell you our best tips for Christchurch: From sights, restaurants & cafes to possible day trips in the surrounding region. Built in the 19th century and completely destroyed in 2011, the Cathedral shows the extent of devastation caused by the earthquake. The ruin still stands in the centre of Christchurch at the so-called Cathedral Square. And although the sight was rather awful for us to see, there is no way past the Cathedral. The positive side to this is that it’s been decided the Cathedral will be rebuilt. Until recently, Re: START Mall was near Cathedral Square. This makeshift container mall was home to some cool shops and cafés. While researching for this article, we read that the mall was finally closed in January 2018. We think it’s such a pity, because in our opinion, the place was one of the coolest in Christchurch. Apparently, the centre is now to be rebuilt and we hope, of course, that now instead of the mall, a really cool neighbourhood in Christchurch can flourish. It is just a short walk away from Cathedral Square to the banks of the River Avon. 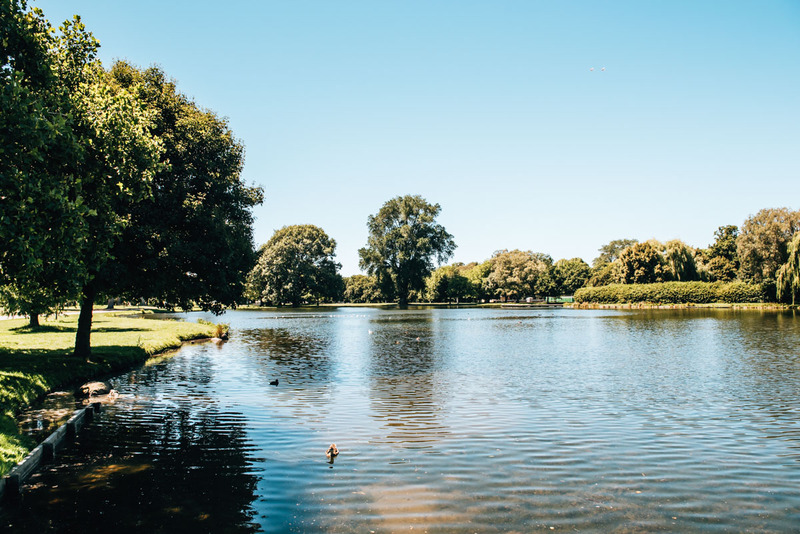 The river meanders through Christchurch and offers beautiful spots that makes it perfect for a short break from sightseeing. At the height between Hereford Street and Cashel Street, for example, there is a terrace with stairs where you can perfectly catch a few rays of sunshine. Further south, you get to wooden boathouses called Antigua Boat Sheds. Here you can rent kayaks and paddle along the river or book a boat trip. 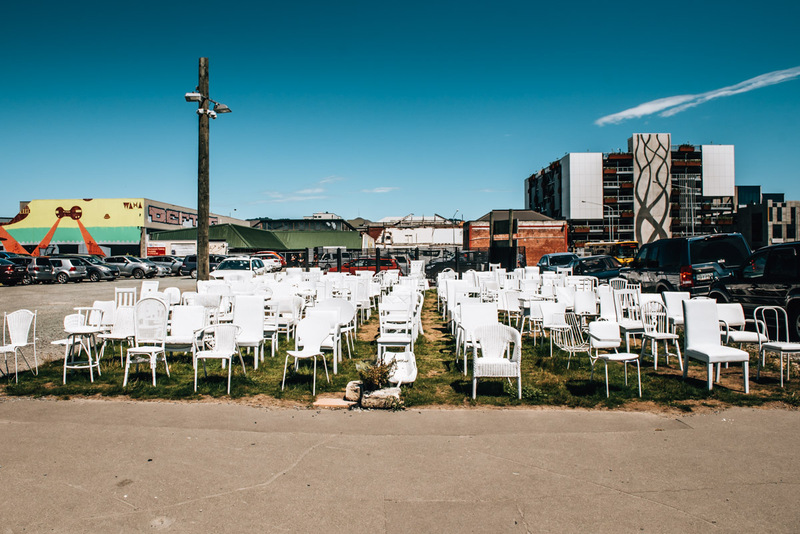 In commemoration of the 185 casualties from the devastating earthquake, an artist created this memorial: every single white-painted chair is in remembrance of one of the lives taken. Although it was 30 degrees during our visit, the sight just gives you goose bumps. We found it a shame, however, that the area does not receive a little more appreciation: right next to it is a huge parking lot, which is a smidge disrespectful. In close proximity to the earthquake memorial is the newly built Church, the Cardboard Cathedral. After the earthquake completely destroyed the old Cathedral, the provisional Carboard Cathedral was built. Incidentally, the name says it all: the Cathedral is made up of a substantial amount of cardboard. For the exciting architecture alone, a short stopover is worthwhile. Hagley Park is a huge park area in the centre of Christchurch. Hard to believe, but supposedly Hagley Park is even bigger than Central Park in New York. 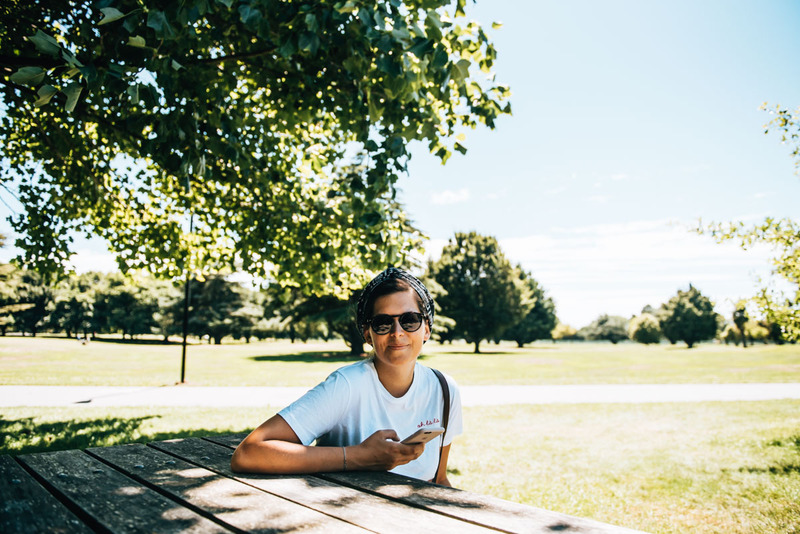 Just because it was so hot during our visit to Christchurch, Hagley Park was a welcome alternative to the city centre. Do not expect any great highlights, but for a refreshing walk surrounded by greenery, we found the park just perfect. Incidentally, in the middle of the Hagley Park is the Botanic Garden, which is also worth seeing. Unfortunately we did not go there, but admission to the Botanic Gardens is free. 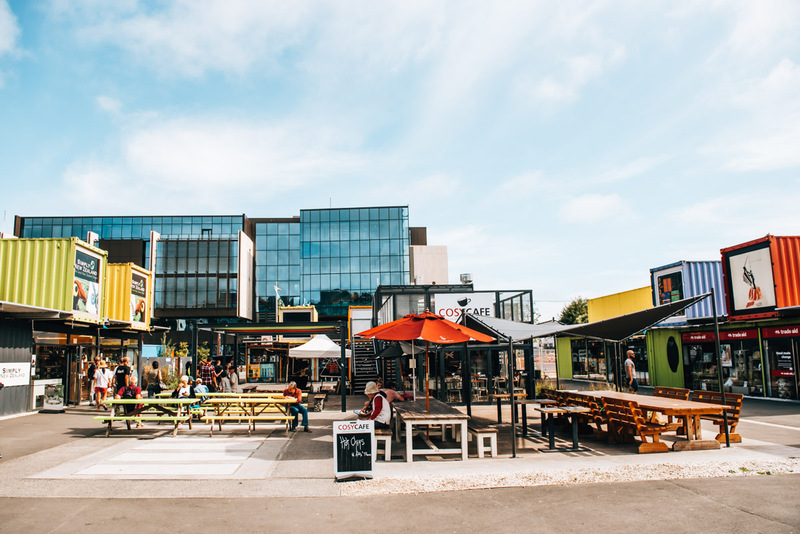 If you spend a little more time in Christchurch, like we did, then it’s definitely worth a visit to the surrounding areas. 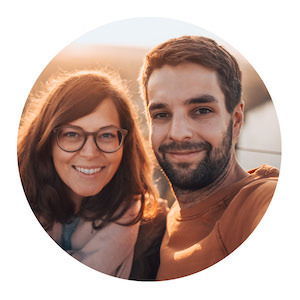 In this chapter, we’ll share with you our tips. Some destinations are almost within walking distance of the city centre, for others, transport is necessary. 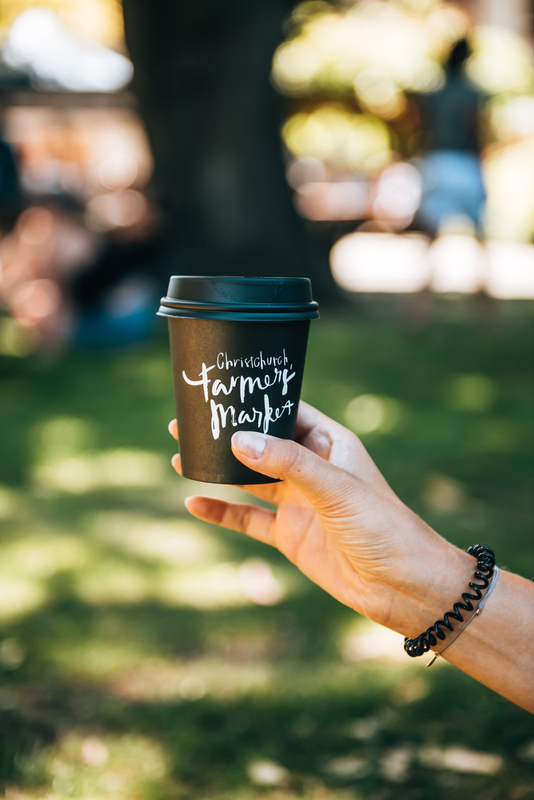 If you manage to visit Christchurch on a weekend, do not miss the Farmers Market in Riccarton. 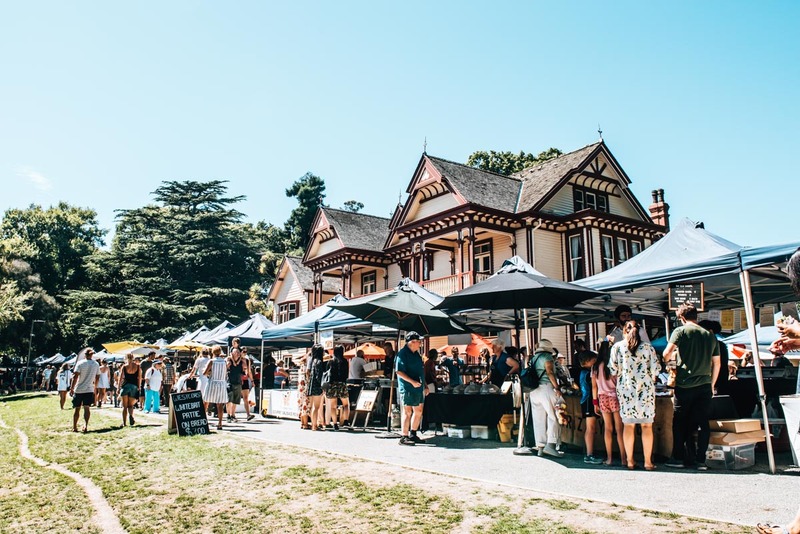 The Farmers Market in Riccarton is the largest in Christchurch and takes place every Saturday on the green area called “Riccarton Bush”. Local producers offer their delicacies for sale here. There are plenty of fruits and vegetables, but especially many stalls where you can get honey, nuts, granola and cheese for example. 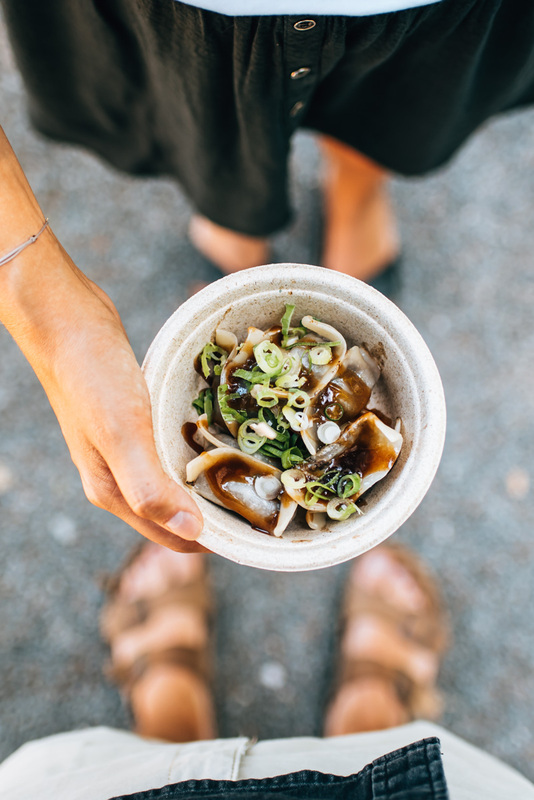 In addition, there are some stalls where they offer cold and hot food: We chose to try the incredibly delicious Dumplings. Address: 16 Kahu Road, Riccarton, Christchurch. The 10-minute cable car ride to Mount Cavendish offers spectacular views. Once at the top, we just wanted to enjoy the view and walked a few hundred metres around the summit station. But you can also do longer hikes and go back to the valley by foot. How to get there: The public bus no. 28 leads directly from the bus station on Liechfield Street to the base station of the gondola. We chose to do the Christchurch Gondola on the last day as we had picked up our rental car by then, thus we drove directly to the parking lot at the foot of the station. It was perfect and we would love to come up here again. 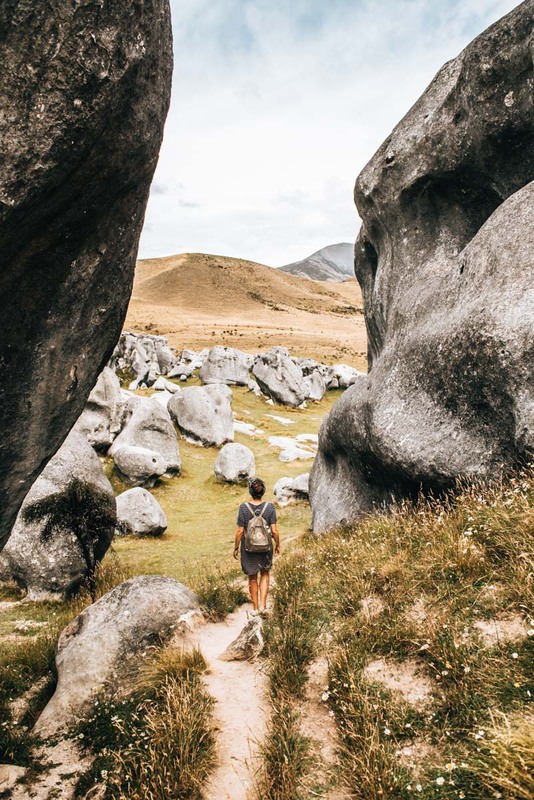 An impressive destination for a day trip is Castle Hill. 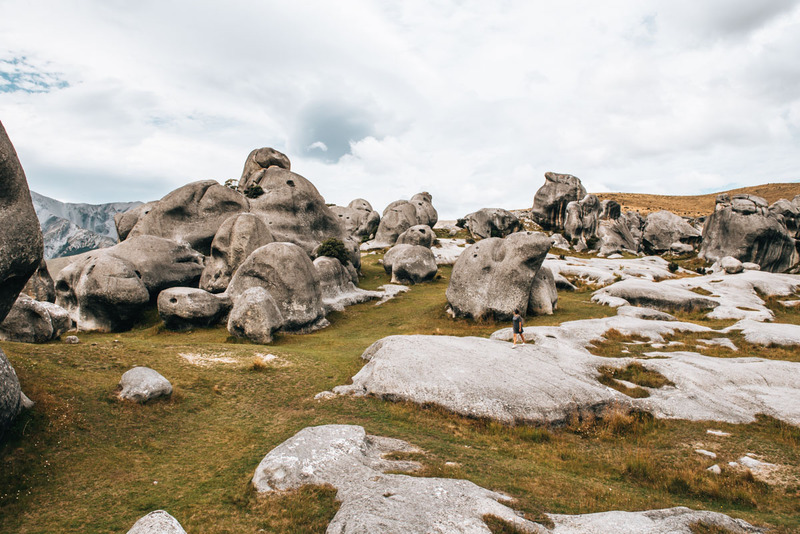 In front of a gigantic mountain backdrop, there are hundreds of limestone rocks of all different heights perched upon a hill. The arrangement of limestone is reminiscent of an old castle, which is why the place is named “Castle Hill”. The bizarre landscape was an absolute paradise for us as photographers. 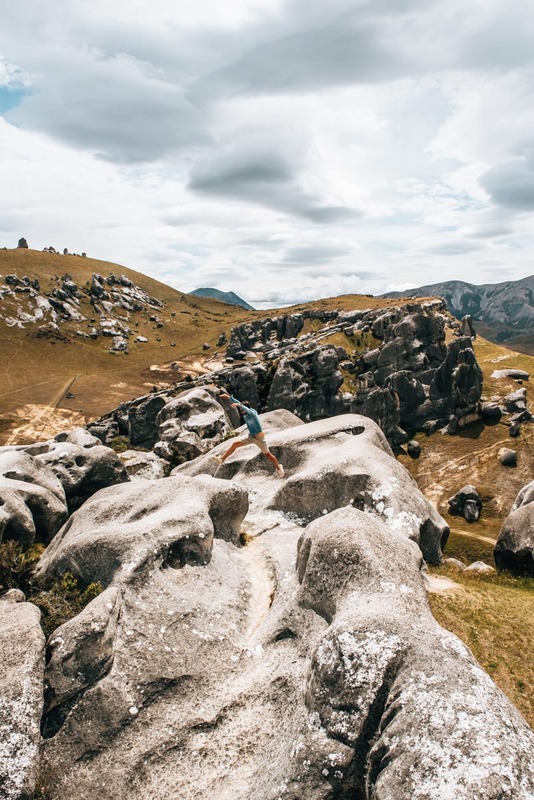 Of course, with a driving time of just under 1.5 hours, Castle Hill is not exactly around the corner from Christchurch, but it’s so worth it. Castle Hill is on the way to Arthur’s Pass, which connects the west and east coasts of the South Island. If your New Zealand itinerary takes you over Arthur’s Pass – perfect! Because you’ll pass Castle Hill anyway. 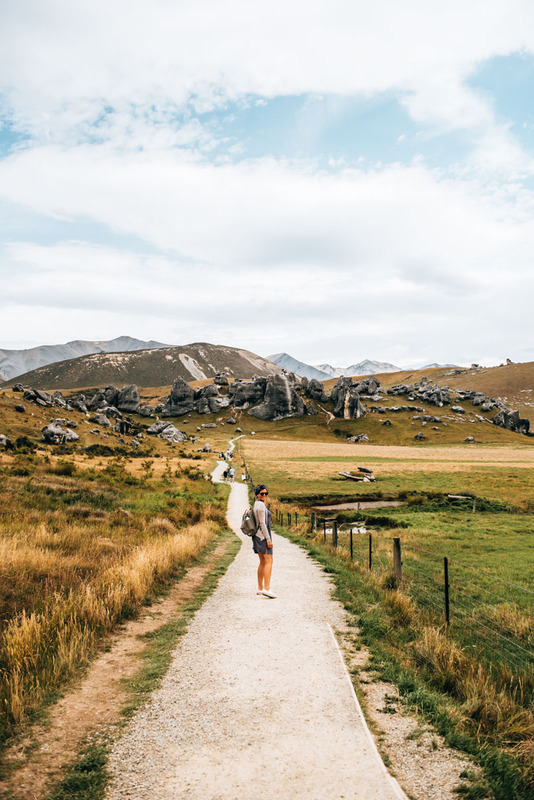 We integrated a trip to Castle Hill into our travel plans and made a detour to Castle Hill on our way south (to Tekapo). From Christchurch you simply have to drive to State Highway # 73 westbound. The only route that you have to cover “twice” is the way from Waddington to Castle Hill (journey time approx. 30 minutes). Overall, you’re about an hour longer on the road if you make the detour to Castle Hill. Castle Hill is very difficult to reach by public transport. There are buses and also a trains (“TranzAlpine”) that stop in Springfield, but then you have to organise transport from there to Castle Hill. Therefore, we recommend you having your own car or camper if you want to come here. There are very few accommodation options in Caste Hill itself, so we stayed in Springfield, which is about 30 minutes away. This is a very small place but we actually found the best value for money accommodation in all of New Zealand: Springfield Motor & Lodge. We paid 70 NZD per night, so about 40 Euros for a double room with shared bathroom. We visited Castle Hill on the day of departure from Springfield and then drove on towards Tekapo. For the onward journey to Tekapo, we recommend you to specifically take the route which leads over State Highway 77. The landscape here is a hundred times more impressive than State Highway 1. Our best breakfast in Christchurch was served to us in the Unknown Chapter. 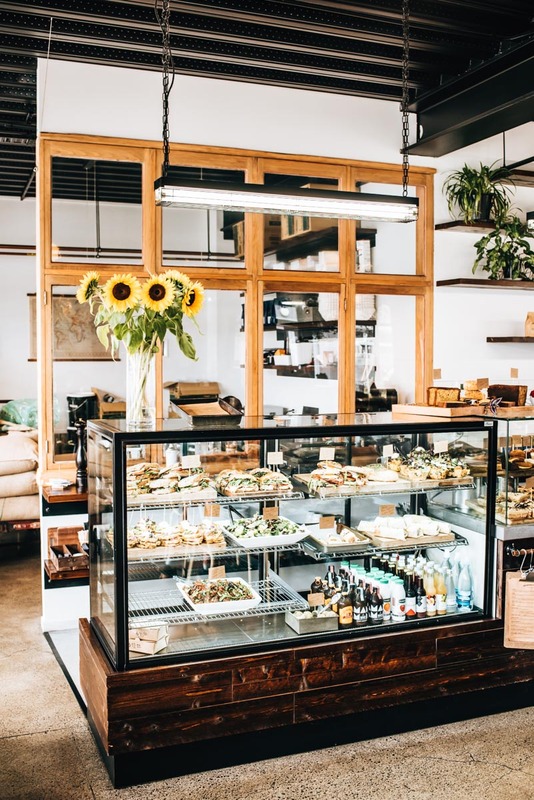 The Unknown Chapter is quite a hipster place with an industrial look. 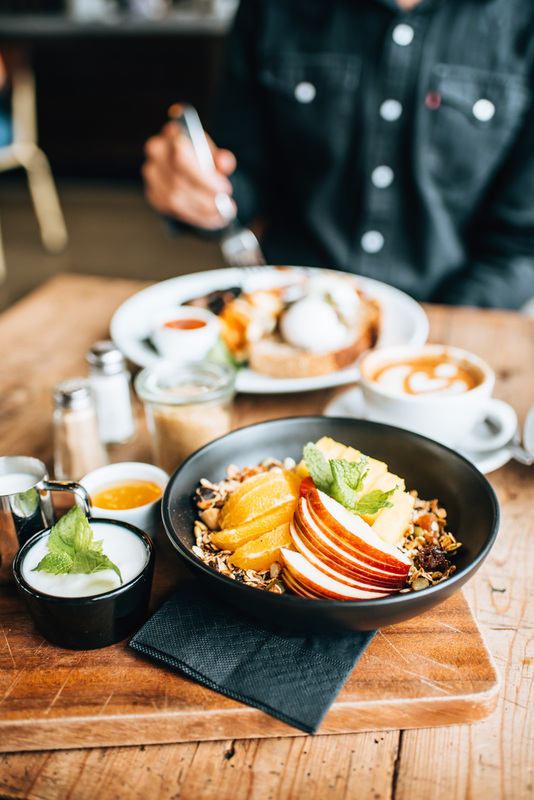 The menu includes classics like Eggs Benedict, Porridge & Granola. Our dishes and the coffee were really delicious and we liked the atmosphere a lot. The cafe is quite large and has plenty of seating, but in the weekend it can be very full. Fortunately, we were able to get a place without a reservation. Note: The Unknown Chapter closes at 4pm every day. In NZ, you have to take in to consideration that they tend to have rather “conservative” opening hours, especially when you are deciding on a location for your afternoon coffee. It was not just a one-off occasion that we found ourselves standing bemused in front of a closed cafe door. 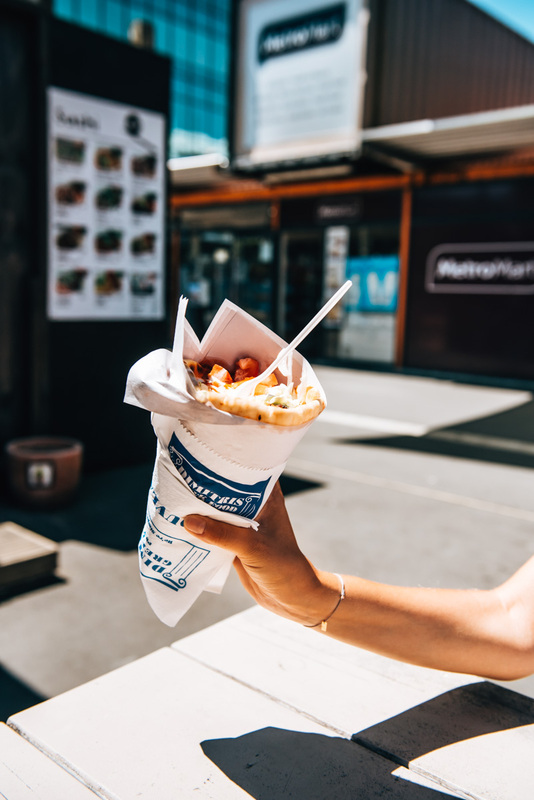 Dimitris Greek Food is our absolute favourite place in Christchurch for a quick lunch. We liked it so much, that we went back a second time. The menu is modest, but not to matter, because the food is super delicious and prices are also very affordable. For vegetarians they offer some good falafel dishes too. Small note: Dimitri has two locations. One of them is a caravan in the Re: START Mall. Even though the mall itself seems to have closed down (see Chapter 1 of this article), Dimitri is still likely to be there preparing delicious food on Cashel Street. Meanwhile, Dimitri also runs a small restaurant outside in downtown Riccarton. For current opening hours it’s best to look on their Facebook page. 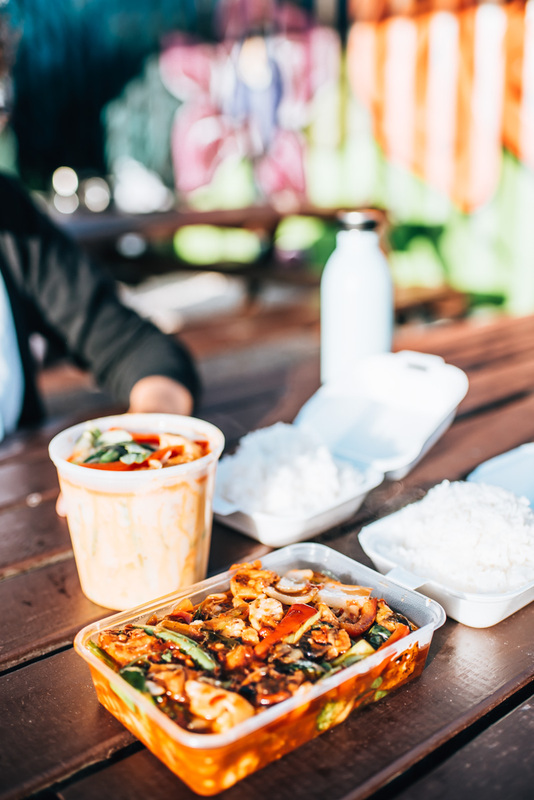 Quite spontaneously, we were looking for a cool spot for a delicious dinner and after a little research, ended up at the Thai container. What can we say? The best decision that day. Not only was the food delicious, we also really liked the location. We were lucky with the weather and enjoyed the last rays of sun on a warm summer’s day. The menu is quite extensive for the tiny size of the caravan. There are also enough choices for vegetarians. Many get their dinner here as a take-away, but it’s also rather nice to enjoy your meal on the wooden benches in front of the caravan. The only point of criticism: it pains us to see so much disposable plastic, especially as it’s so unnecessary! Christchurch has the largest airport in the South Island: It may be good to start your journey through New Zealand, like we did, at Christchurch International Airport. From here, many flights land and depart for Australia as well as Asia. The airport is only about 10 km northwest of the city centre. Taking the Taxi was out of the questions as it’s the most expensive option costing about 50 to 60 NZD per way! Alternatively, there are some highly recommended shuttle services in the form of mini-vans, which transport several people and drops everyone off at their desired destinations. So we went with “Super Shuttle”. The vans leave as soon as the van is full (or at least somewhat full), and this doesn’t usually take long. The price is absolutely ok: we paid 15.50 NZD per person. Depending on the destination and route, the journey takes about 20 to 25 minutes. You can find the shuttle services directly by the main exit of the airport (on the left hand side). The cheapest option is by bus, which goes directly to the bus station in the city centre. There are two lines: The Purple Line (to Sumner via Riccarton and the city centre) and Bus No. 29 (to the centre via Fendalton). 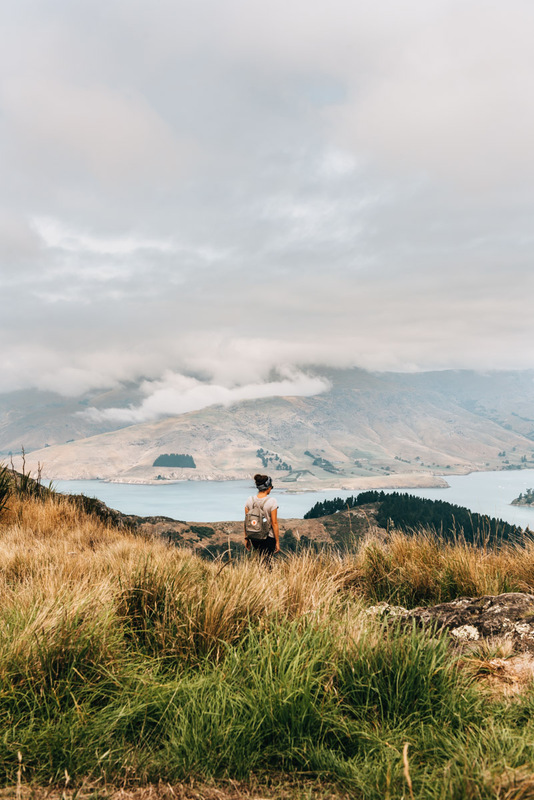 As a single trip already costs NZ $ 8.50 per person, it’s not that much more to go with the direct shuttle and get dropped off right at our accommodation, hassle free. The centre of Christchurch is perfect for exploring by foot as most sights are within walking distances of each other. 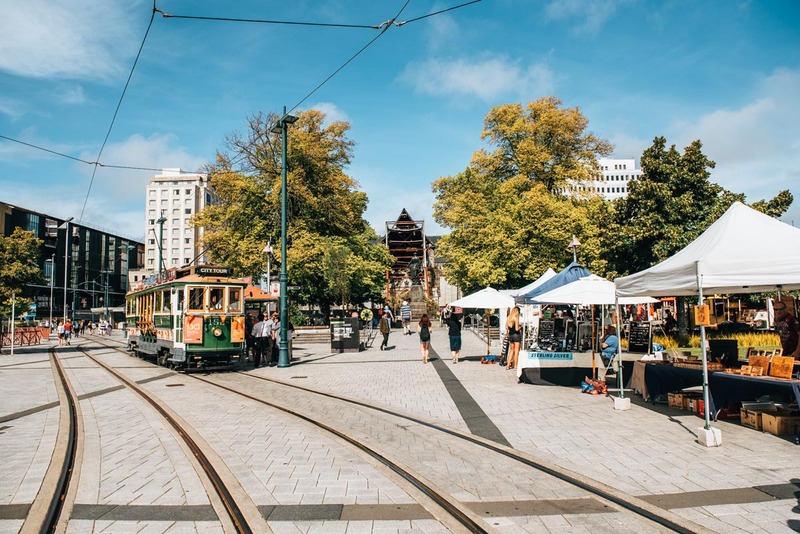 In exceptional cases, when we were already very tired from the sightseeing day, we simply organised an Uber ride to get around long distances in Christchurch. That was absolutely no problem and relatively cheap. 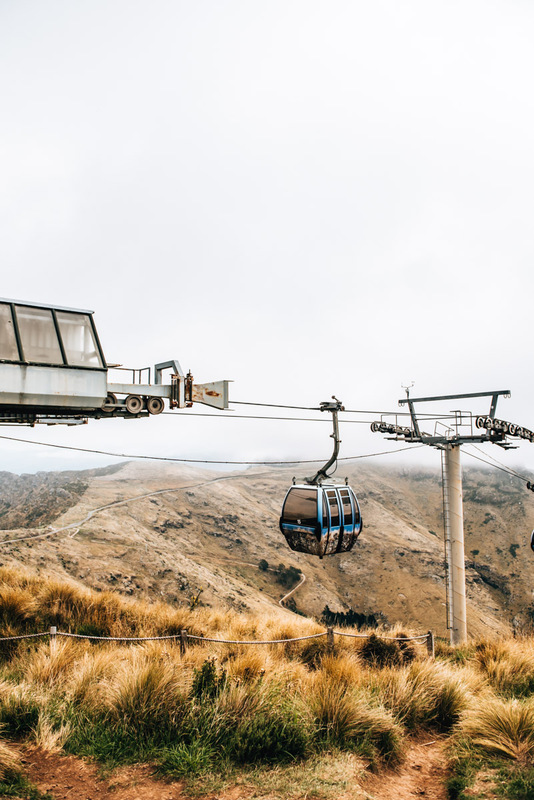 There are also plenty of bus lines that will take you to more distant destinations such as the Christchurch Gondola. 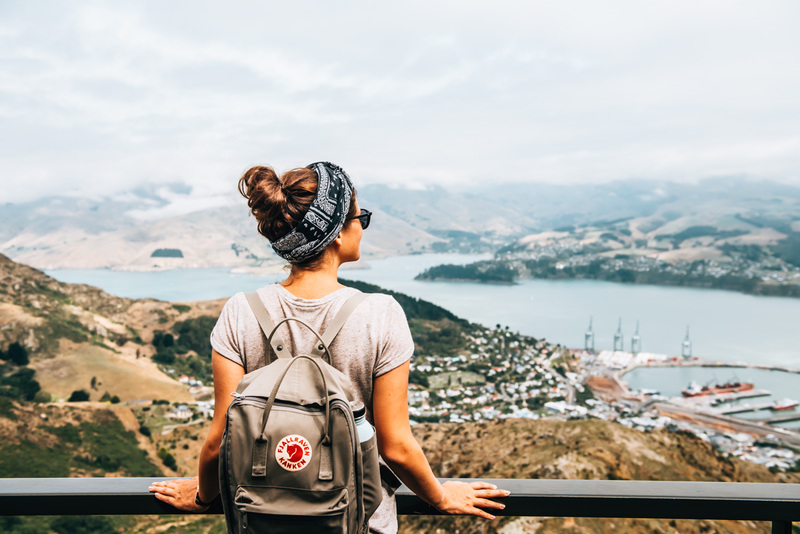 As most people either start or finish their journey in Christchurch, the onward journey from Christchurch is of course full of possibilities. We booked our rental car to pick up on our last day in Christchurch. 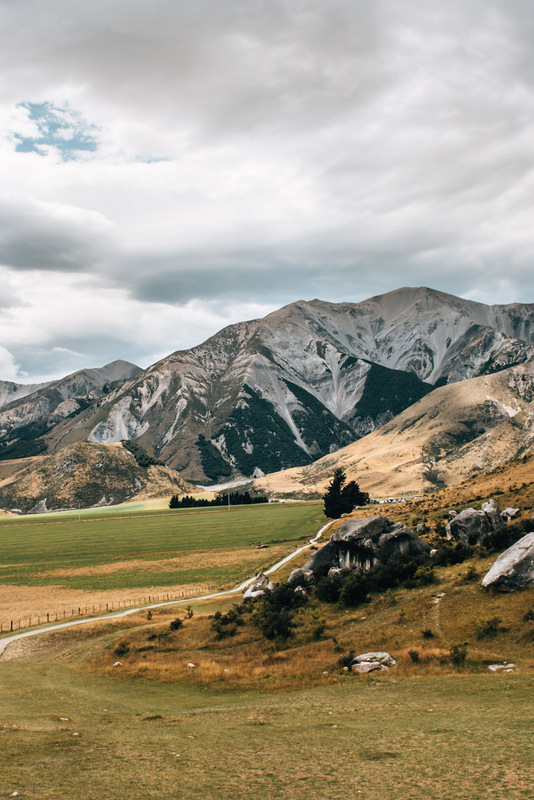 Thus, we could reach both the Christchurch Gondola and Castle Hill quite easily by car. The disadvantage is, of course, that you have to go back to the airport again to pick it up. However, you do save some money because for Christchurch itself a rental car is not very necessary. If your trip to Christchurch leads you to Lake Tekapo then we can recommend a stopover in Castle Hill. You can find more information in section 3 of this article. Our rental cars were booked through Sunny Cars for both our NZ trips (2013 and 2017). You will find a detailed article on our blog soon. Disclaimer: This blog article contains our personal recommendations in the form of so-called affiliate links. If you book or buy something via the links, we will get a small commission. For you, this does not change the price at all. Cool thing, right? For our rental car in New Zealand, we received a discount from Sunny Cars – huge thanks to them! This however, doesn’t change or influence our opinions at all. We have booked through Sunny Cars on several occasions (whilst paying full price) and always had good experiences. Have you been to Christchurch? Do you have any further tips for sights or restaurants? Or are you going to Christchurch soon? We look forward to reading and responding to your comments!